The Seasoned Advice answer to Why add salt to the water when cooking pasta? is that it makes the pasta less sticky by inhibiting starch gelation. This seems to be a controversial question, with lots of improperly sourced answers spreading. Is there an authoritative source, such as published experiments, chemical treatises or work by famous cooks, that gives a final verdict on whether adding salt really does affect the starch gelation, thus making the pasta less sticky? Starch is extensively well-researched in food science, so the short answer is yes, there is an authoritative source; there are a myriad of authoritative sources. So, really, to a scientist, the question "does adding salt to pasta water reduce sticking?" is bordering on ridiculous. The answer is, as the answer often is, it depends. The following is taken from Starch: Chemistry and Technology, an academic tome that is all about - you guessed it - starch. Effects of salts on gelatinization are more complex than those of nonionic solutes, as they are solute-specific and concentration-dependent. For most electrolytes, an increase in gelatinization temperature, Tm, is found at low salt concentrations. At high salt concentrations, Tm decreases and can even drop below the initial value. [...] In general, the effect of neutral salts on starch gelatinization follows the order of the classical Hofmeister (lyotropic) series, particularly in the case of anions. [...but] cations of different chloride salts exhibit a more complicated behavior as evidenced with polarizing microscopy. In plain English: Adding a little salt might reduce the gelation and thus sticking. Adding a lot of salt might increase gelation and sticking. The definition of "a little" and "a lot" depends on how much and what kinds of starch are in the pasta, what else might be in the pasta (some already have salt! 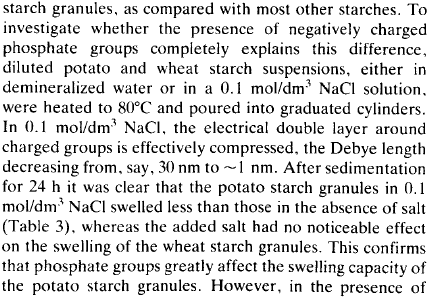 ), how dispersed the starch already is in the water, what kind of salt you're using... you get the idea. Table salt is sodium chloride - NaCl. You'll notice that Na+ is about halfway to the "salt out" side and Cl- is right smack in the middle. So, even with my limited understanding of all the mechanics at work, it does stand to reason that the effects of having both would be unpredictable. It's easier to predict the effects when you have something like calcium perchlorate, i.e. Ca(ClO4)2, where both the anions and cations are on the "salt in" side. Obviously, those kinds of salts are not in your average home kitchen and I doubt that they're even used in commercial food plants. ...although there are other well-known culinary salts other than sodium chloride, including ammonium chloride AKA salmiac, the (in)famous "salty liquorice" salt. That is technically still "salt". Which salt you choose will of course have wildly different effects on chemical properties including starch interaction. So hopefully this helps explain some of the wildly opposing anecdotal reports you've read. There is no simple answer because your kitchen is not controlled conditions. However, there is some truth to the statement that salt inhibits starch gelation. It might have that effect, at the right concentration and with the right set of ingredients. Yes, there are sources. And it looks like we might have caught McGee in an error. McGee says "Salt in the cooking water not only flavors the noodles, but limits starch gelation and so reduces cooking losses and stickiness". He doesn't give inline citations, but among his sources for the chapter, he lists Barsby, T. et al. Starch: advances in structure and function. I searched this book on Google books for "salt" and it listed some experiments done with potato starch. So if the information that salt limits starch gelation is based on this book, it is valid for potato starch. And among the sources listed in McGee for this chapter, this book seems the most probable source. which means that what is true for potato starch is not necessarily true for wheat starch. I am not 100% sure that McGee is wrong. Maybe somebody came later and proved that there are circumstances where wheat starch is inhibited in gelation too, and McGee is using him as source. Or maybe durum starch is not the same as wheat starch. But until I see such a source, I'll stick with believing the guys who published their own experiments. And their conclusion is that salt water has no effect on wheat starch at all. So no salting necessary. (unless you think that the taste is different, but I'm not completely sure of that, and anyway, you only asked about stickiness).